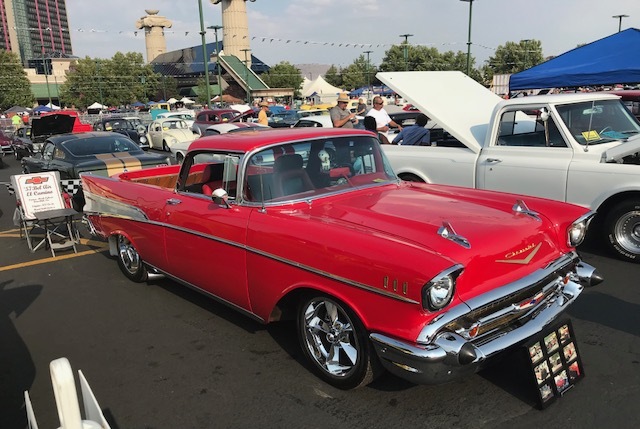 This was the 32nd year that Hot August Nights was an “official” event here in the Reno/Tahoe Area of Northern Nevada. We have been participating in this local tradition with many different cars since 1992 for 26 years. Over the last few years, as the economy was in the dumper, the participants and visiting tourists certainly had dropped quite a bit and it was noticeable. 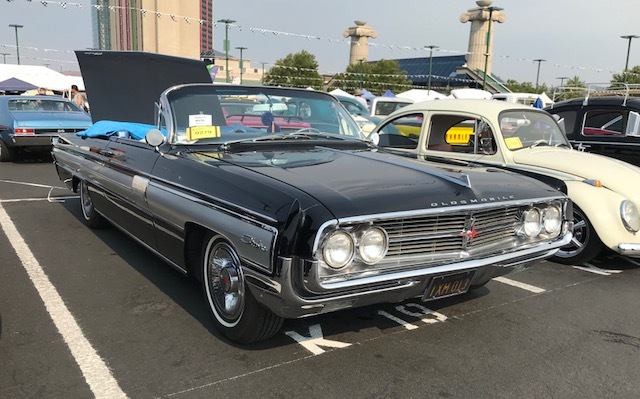 This year we could tell that both car totals and spectators were up, and it seemed to our group, that we started to see more cars from many other States as we used to in the years past. It was great to see, at least for the spots that we have been tending to hang out at the Atlantis and the Peppermill Casinos and Resorts. Although we have seen a bit of a change over the last 6-7 Years, in that many more of the crowds and cars, seem to come out in larger amounts on the Thursdays and Fridays, as opposed to the “Olden” days when Saturday nights seemed to be the most jammed. People may be heading home bit earlier now, just an interesting note. Here are a few pics from Friday, August 10 and evening of Saturday August 11, 2018 from the Atlantis. This was one of the neatest machines, to me anyway, that I have seen at HAN in quite some time. 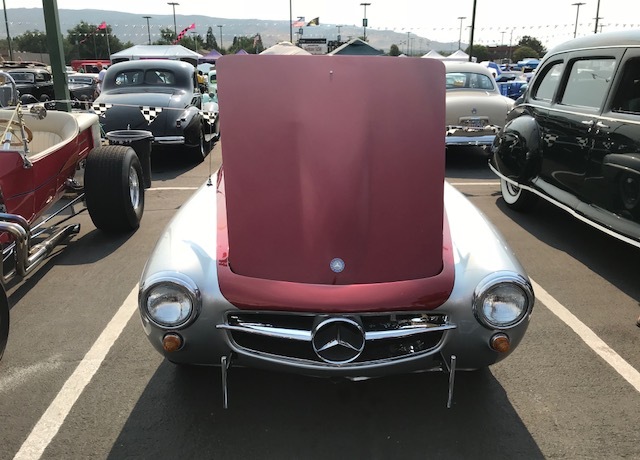 A late ’50’s Mercedes SL 190 roadster with a Small Block Ford stuffed into it like an early Shelby Cobra would have had under the hood. 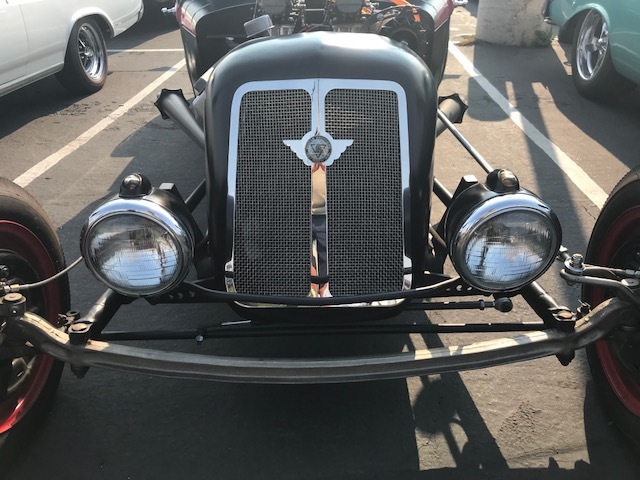 You certainly do not see many of these “Hot Rodded”, or even around at shows etc. We did have one at a Vintage Race at RFR a few years back and that was rare to see one race. 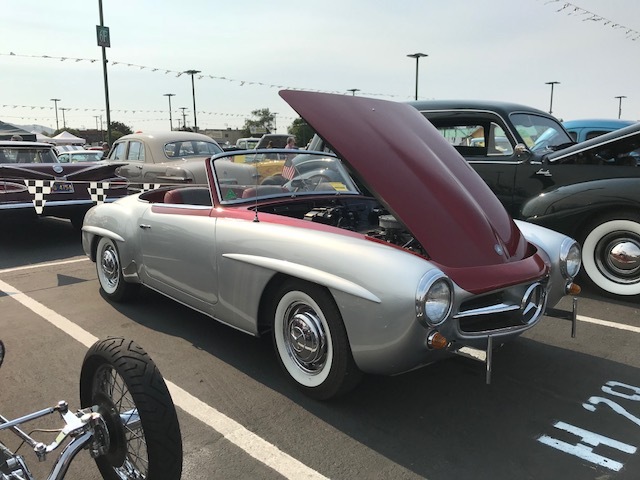 The classic German silver with the candy burgandy hood accent was beautiful…….couple of “Thumbs Up” from us for this pretty car. 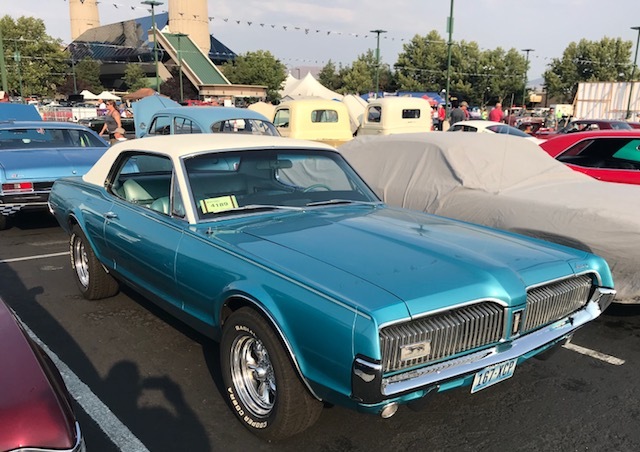 Top notch “63 Olds Starfire convertible behind the Nevada Musclecars “ol blue” Nova….Always loved the spun aluminum side trim and dash inserts on these cars. 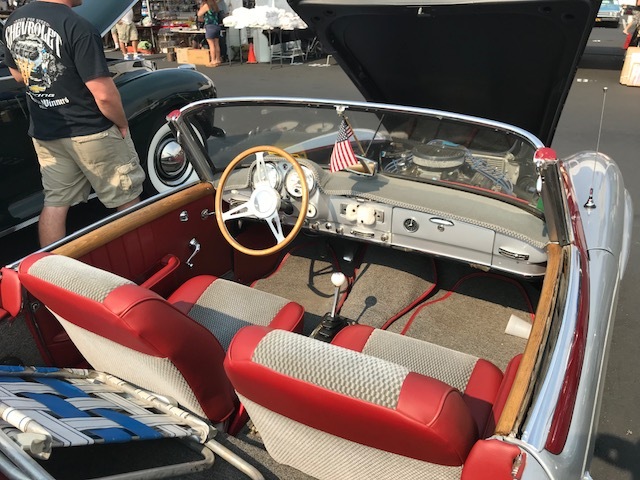 Brings back lot of fun memories, as Pops had one when we were kids, in a hardtop. 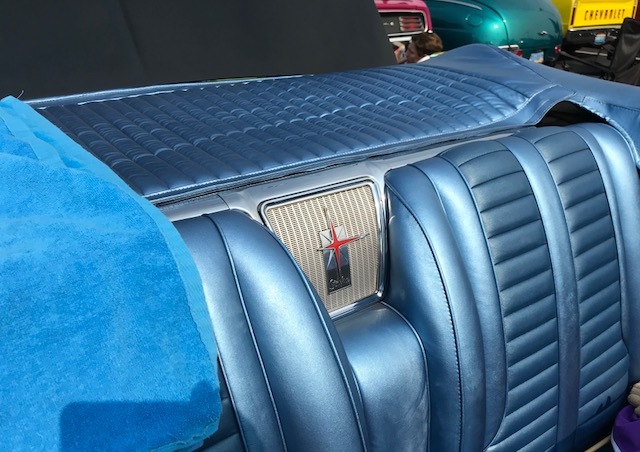 That back seat in the silver blue and the custom star on that speaker grate was quite familiar. 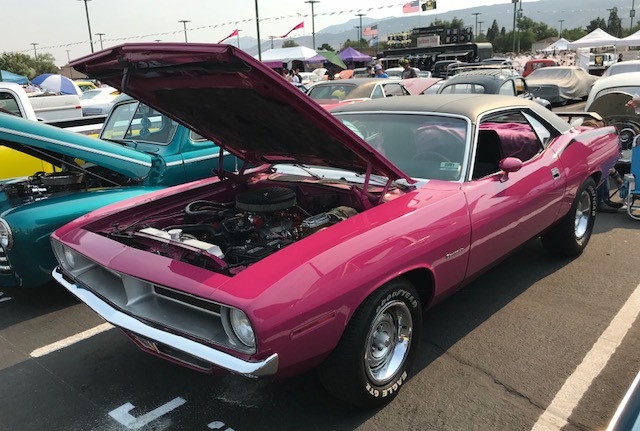 Passionate Purple ‘Cuda for the Mopar fans in the crowd. 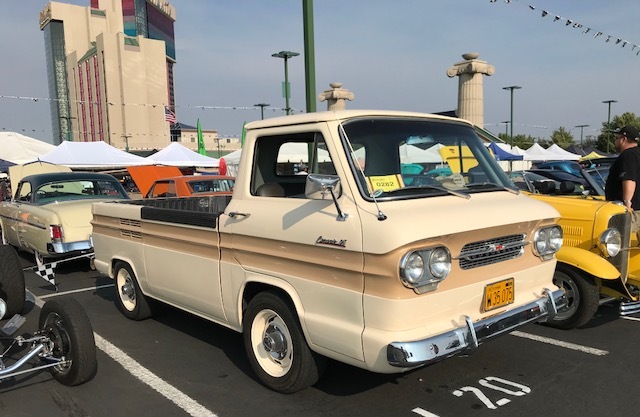 Mid Sixties Corvair pickup across from our camp. Classic HAN lineup for an eclectic shot……An old Willy’s, a Chevelle, a Dodge Challenger and the a classic ’30’s Roadster. 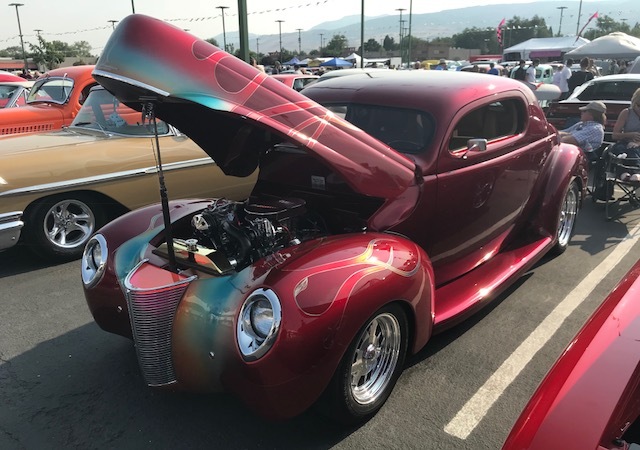 1940 Willys Coupe, ’60’s drag style, with some fogging in the nice candy red paint. 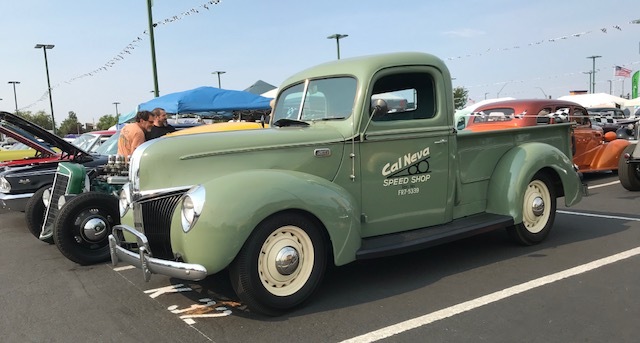 We continue to see many ’40 Willys builds, but not many ’33 Willys out there ?…. 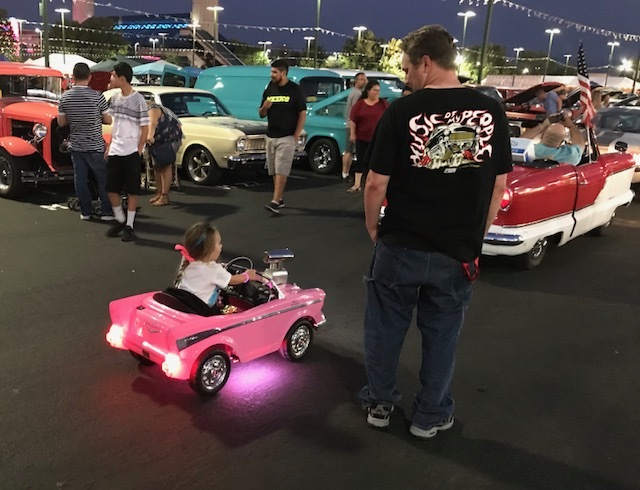 This little “cruiser” was so cute going by us, with proud Dad of course, in the little Drop Top ’57 Chevy. 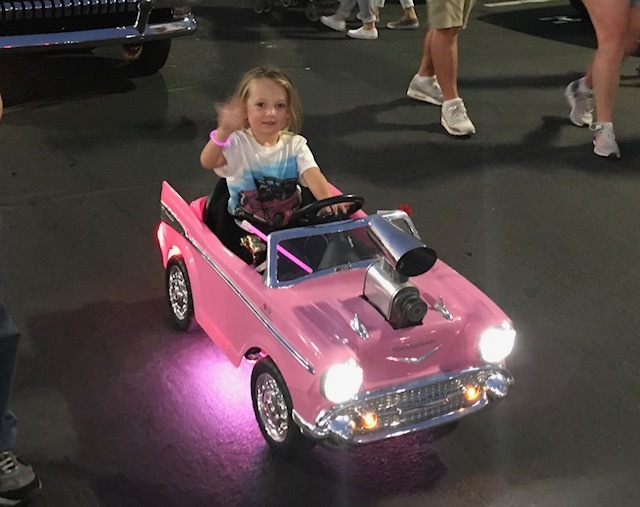 She was practicing her parade wave to us……..Her machine is not the much smaller than that little ol Nash convertible ahead of her pink Chevy with the blower. 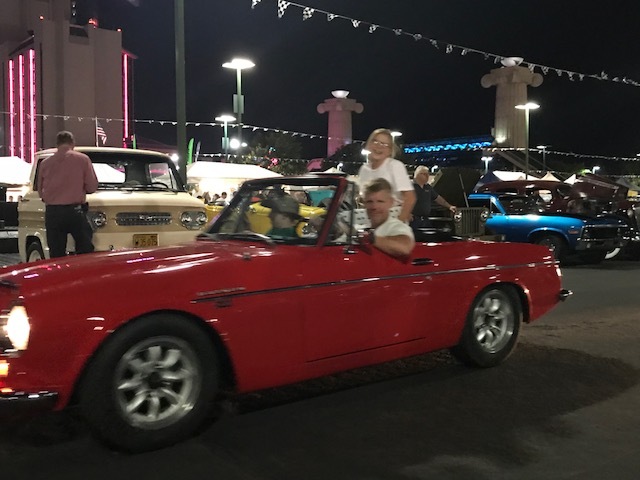 Young lady having fun in the Datsun 2000 roadster with one of our favorite style of wheels from late ’60’s/early ’70’s…….the Trans Am Mini-Lite. Superb 2nd Gen Chevy Camaro from “71/”72………Still like these after having couple of them in years past. 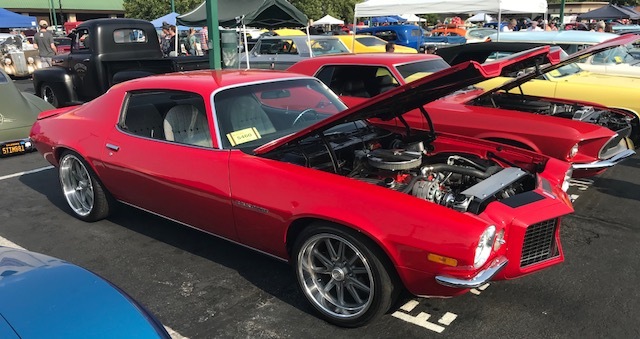 Did not see any “slopenose” Camaros from ’74-’76 this year? Ideas maybe….. 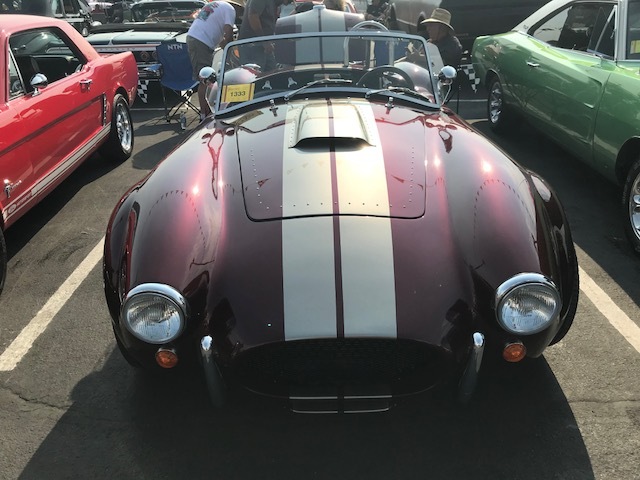 This was a solid Cobra replica with nice color combo of dark maroon and silver. Chopped top “40 Ford custom coupe………………YA BABY!! 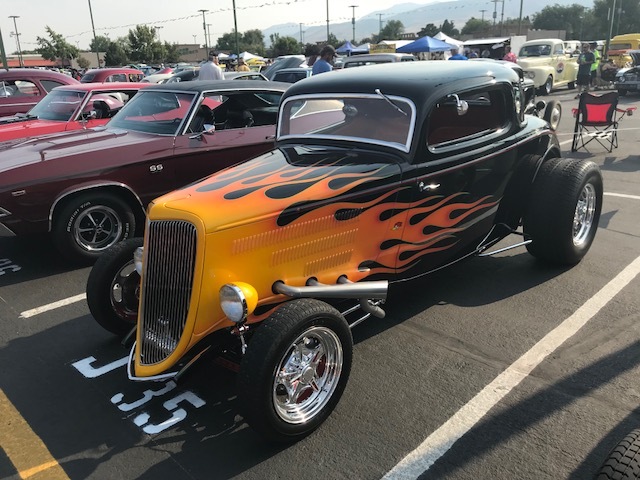 Always a great look…..the ’34 Ford Coupe with yellow “California Kid” flames. 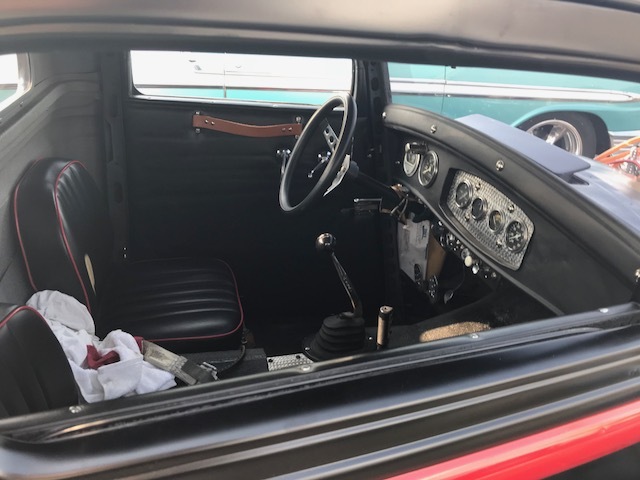 Some closeup “artsy” shots of a late ’20’s Dodge Pickup next to us with an early ’50’s Hemi in it……..a very nasty ride. 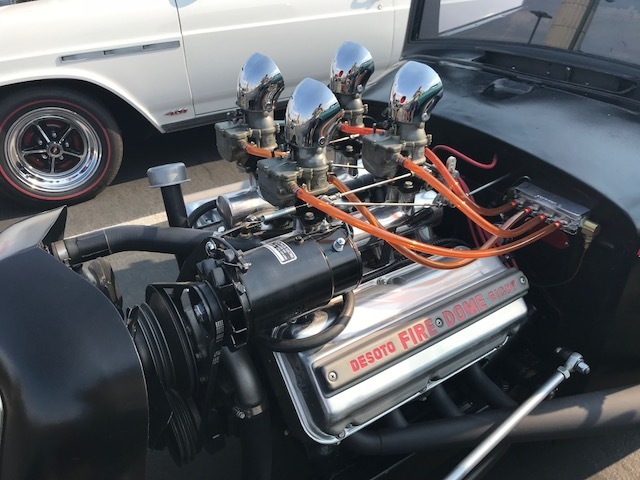 Great execution by these guys to do a 1957 El Camino. 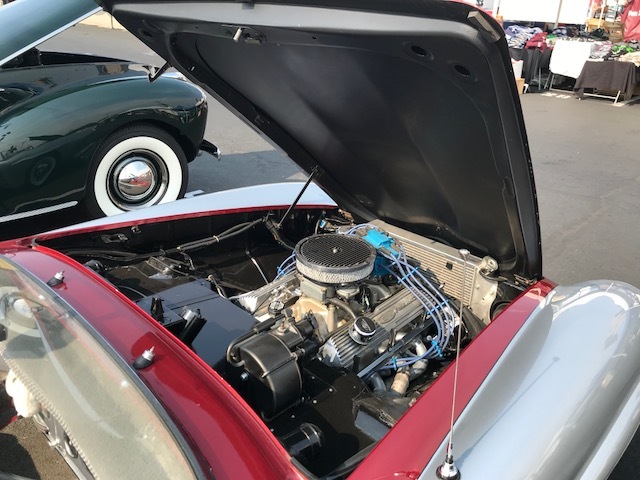 ….great coverage of many different cars of the greatest era of all time ..the late 40’s,50’s,60’s. Bringing back so many great memories & best of the go od times for a lot old high school gang,but the service men&women who went to protect this country so we can enjoy these times!!!. so the also can enjoy their rides & have fun.